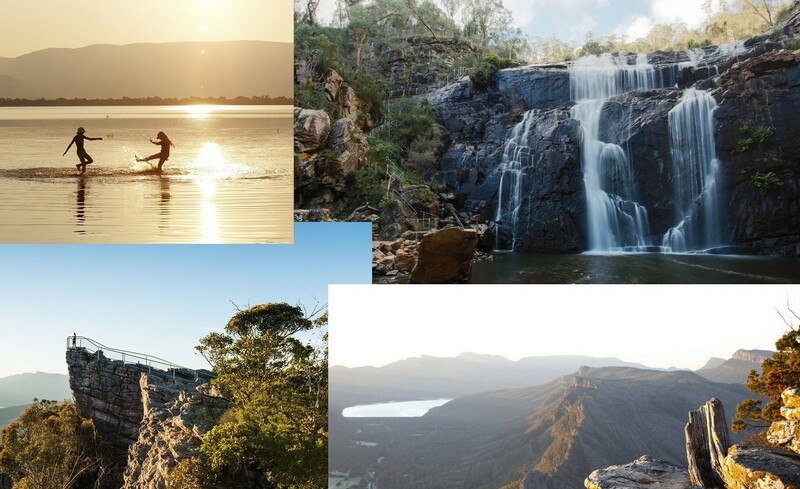 48 Hours in The Grampians……………………. Whether your thing is bracing walks amidst stunning bush scenery, a perfect Shiraz at one of the many local wineries or taking in a sky full of stars on a perfectly clear night – you’ll find it here at Lake Fyans. Just a few hours out of Melbourne, the surrounding national park is one of the most picturesque and abundant regions in Australia. It’s a big call, sure, but once you’ve been to the Grampians you’ll be inclined to agree. Don’t worry about our southern weather’s predilection for unpredictability – the Grampians are breathtaking in any conditions. It’s into the car, radio on, window down and off you head towards your wonderful weekend away. Arrive at Lake Fyans Holiday Park and check into your campsite or cabin then spend some time unpacking and strolling along the lakefront breathing in some of that cool, clean air. If you arrive early enough pop along to Roscoe’s Bistro (open seasonally) and indulge in the fantastic fish & chips. For Saturday night if you fancy a very delicious, filling home cooked style meal then book in here at Lake Fyans reception for dinner at Roscoe’s Bistro and afterwards you can head back to your cabin or campsite and sit out on the deck or around your campfire with a glass of wine under a canopy of stars. Saturday & Sunday – so many options…………………. Wake up to the magnificent views of the lake & mountains of the Grampians National Park that are just in front of you, and if walking is your thing then here’s a few options to get those legs moving & lungs pumping over the next two days………………..depending on how fit & fabulous you are feeling take your pick and off you go…………………………….to start, head to Halls Gap, just 12 minutes’ drive away. If walking is not your idea of a wonderful weekend getaway then there is plenty of other fabulousness to full your 2 days. If you are thinking coffee & brekkie first, then here are two great spots in Halls Gap to start your morning aim for Livefast Cafe for a divine coffee & fabulous food or alternatively head past the Information Centre to Harvest Halls Gap Cafe, Restaurant & Provedore, the food & coffee here are superb too, and they also open for dinner on Fridays & Saturdays, their reputation precedes them so it pays to book or you could miss out! For those of you with energy to spare, drive up Victory Road and stop at the Wonderland car park and head up to The Pinnacle, a medium/hard grade walk up through the Grand Canyon and Silent Street before reaching the top. Stop to catch your breath & take in the glorious, breathtaking views over Halls Gap, the Grampians peaks & Grampians lakes before heading back down. For a slightly easier route up & back start your walk from the Sundial Carpark. After all that walking & driving head back to Halls Gap and grab an ice cream from Coolas Ice Creamery, they are famous for their delicious homemade waffle cones and variety of flavours, you simply can’t leave Halls Gap until you have one! While you are in Halls Gap also check out the Brambuk Cultural Centre, it’s a must visit, paint a boomerang, and watch their award-winning multimedia presentations in the Gariwerd Dreaming Theatre. Their gift shop provides an excellent selection of books, gifts, Aboriginal arts and crafts and a wide selection of Park maps are also available. For those with less enthusiasm for walking and more enthusiasm for something a little less strenuous…………… Grampians Wine Tours, they offer some superb packages with visits to let you discover some of Victoria’s best wineries in the incredible region of the Grampians. The tours take place in luxurious, comfortable, air-conditioned buses but numbers are limited so book in! They also do a Silo Art Tour, a great way to see four of the silo art locations, plus morning tea and a lunch stop as they drive through the towns of the Wimmera. If you are feeling extravagant and feel like getting “up in the air” to see the sights, then check out Grampians Helicopters for some unforgettable sightseeing & package experiences. Just a 5-minute drive along the road at Pomonal Estate is their new winery, microbrewery and cider house where they offer wine, beer and cider tastings & sales, local produce platters, light lunches, homemade cakes, coffee and tea, local produce and art, kids games & activities and spectacular Grampians views. Just a few minutes’ drive from Pomonal is Red Rock Olives. They produce award-winning extra virgin olive oil, table olives, olive salt, artisan vinegars and more (the fig balsamic is an absolute taste sensation) so pop in and have a sample, we guarantee you won’t leave empty handed. Carry on up the road towards Halls Gap Zoo, Victoria’s largest Regional Zoo, and there you will find 160 species of native & exotic mammals, reptiles and birds spread over 21.5 hectares and you can get up close and personal with the delightful Meerkats or experience holding an alligator, snake, chameleon or play with Australia’s largest carnivorous mammal, the Dingo. Turn left out of the Zoo and just along the road is Fallen Giants Vineyard at Halls Gap Estate. The vineyard was planted in 1969 to Shiraz, Cabernet & Riesling totalling 23 acres, it has amazing views over the Grampians & vineyards and the Cellar door is the perfect place to taste and enjoy their wine. Make your way to Great Western for fabulous wine tasting sensations & samplings check out Bests Wines, one of Australia’s oldest and continuously run family wineries or head to Seppelt, whose foundations were laid in 1851 and where they have a labyrinth of underground cellars, known as “The Drives” which wind for three kilometres, worthy of the wine tours it’s a must see even for the non-wine drinkers amongst you. Great Western is also home to the Steel Cutters Cottage where you can graze through delicious tasting boards or plates along with the regions outstanding wines. Open for dinner with food inspired by French & Italian flavours, they are very popular, so bookings are recommended. If coffee is your thing, then along with the Halls Gap deliciousness, local to us are the Pomonal General Store in Pomonal, the Moyston General Store in Moyston, Salingers in Great Western and in Stawell there is the Gallery Café, the Black Duck Café and Lillies & Lattes, where they all offer a great coffee and wonderful bits of deliciousness too just in case you need a “little something” to go along with your fabulous flat white!